We had no plans on writing a post about buying a new dishwasher. But our dishwasher thought it was time. 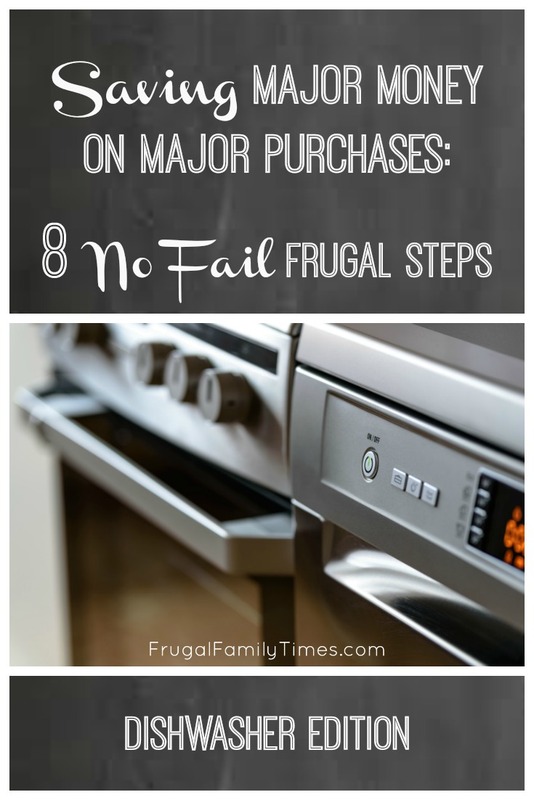 Whenever we need to replace some appliance or household thing-a-ma-jig we use our tried and true Frugal Shopping Steps. You can thank our old dishwasher for prompting us to share. 1) Can it be fixed? We opened her up and poked around a bit. There was nothing completely obvious like a wire lose or anything. That was the end of our skills. Would it be worth bringing in a pro? "Determine how often you plan to use it. If you run it 3 times a day, then plan on it only lasting for about 3 years. If you run it once a week, then it might last 12 years. It should have a life span of three uses per week for 10 years." If this estimate is correct, the typical dishwasher has 1,560 runs in her. We typically run ours daily. So our 8-year-old has had approximately 2,912 runs. I like that calculation, it makes me resent her breakdown less. She gave us twice what we could expect of her. (OK, enough talking about the dishwasher like a person). Our conclusion: Not worth repairing. A repair could cost as much as a new one. 2) Can you do without? I wish we could say yes; it would be so frugal of us. I know lots of people manage without one. But I am pretty sure that we would cook less if we had to contend with a counter full of dishes afterwards. Cooking less means more frozen meals, take-out and meals away from home. Also, Energy Star dishwashers are easier on the energy bills than handwashing (not unlike a shower is more energy efficient than a bath). Taking their numbers at face value, the cost of a dishwasher is basically a breakeven proposition. Our conclusion: The savings we get from cooking at home would outweigh the cost to replace our dishwasher pretty darn quick (for example, if we spend $20 a week in convenience food, because of the pile of dishes, we'd spend $1040 extra in the first year alone). 3) What are your "non-negotiables" as far as features? What's a good replacement? This can be a tough one to answer. But, just like the unbiased beauty product review site I use, we use a review site for household stuff. Good ol'Consumer Reports. Our conclusion: We narrowed it down to a few reasonable replacement models with a regular price of between $500 and $600. 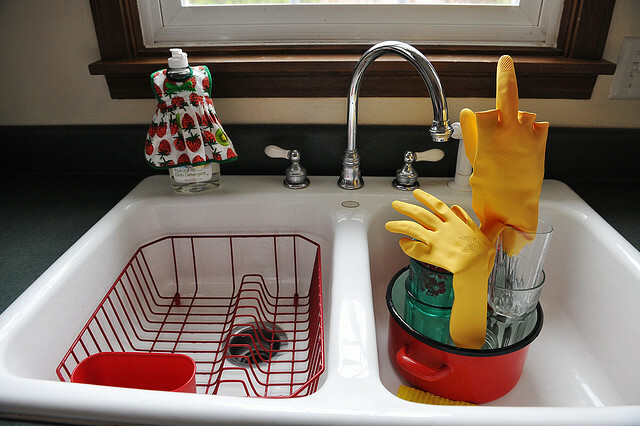 It won't be flashy, but it will clean our dishes for us. Ultimately, that's all it needs to do. 5) Can you find one used? Usually we explore the online classifieds to see if we can find what we're after used. Our favourite by far is kijiji. We haven't had much luck with craigslist (but it seems like it's the go-to site for bargain hunters in the U.S.). You may have a workplace buy-and-sell that's worth checking out. Ed's school board has one, and we've had great luck there over the years. My theory is that people are less inclined to try and pull one over on a colleague than a stranger, so I feel most confident of the stuff listed here. Our conclusion: Given the number of things that could go wrong with a dishwasher, we weren't willing to risk buying one someone was getting rid of. Sometimes there are things listed that are "new in the box", but we weren't lucky enough to find one of those this time. Flipp is the app we like to start with. Such a great place to find deals. (For the first draft of this post in 2012 we used Deal Genius and before that Wishabi - neither exist anymore!) Google Shopping is supposed to be good, too, but we haven't had the same success. Our conclusion: Our search found Sears had a model that was rated well for $150 off. We could replace our dishwasher at $399 (plus tax). 7) Visit some brick-and-mortar stores to compare. Can you find a floor model or scratch and dent? We called ahead to the Brick to see if they had any scratch and dent models. They implied they did, but then when we got there this wasn't really the case. The old Bait-and-Switch. We walked out and resolved not to return, but before we left we compared their prices with the one we had in mind on sale at Sears. They had nothing to offer us. Our conclusion: We drove to Sears with the hopes we could buy the floor model for less. It wasn't to be, so we ordered the sale model and left satisfied. By doing as much yourself you can you can save money. Dishwashers are surprisingly light so we could pick it up ourselves (saving a $65 delivery fee). We also dropped the old one off a local scrap metal dealer, which saved us the $20 charge that Sears would have tacked on. Ed installed it himself. (Sometimes we forget that we blog. We should have gotten some action shots. You would have been moderately impressed.) 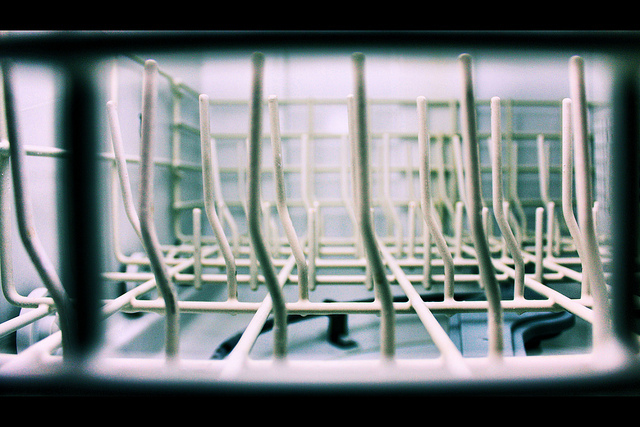 It was tricky but much easier to replace an existing dishwasher than when we installed it the very first time. No serious electrical or plumbing involved, so we didn't need to involve my dad (but his installation rates are very good: usually a meal or two and some time to play with his grandkids). The new machine works vastly better than our old one. Ed has declared that even I could load it and things would come out clean. (That's high praise because Ed is very particular about how the dishwasher is loaded. He's has said to me in the past, "If I ever leave you, it's because of how you load the dishwasher." Harsh, huh? Do you have tricks and tips for getting good deals on appliances? Please! Share them below in the comments. Keep reading here for more of our Saving Money Tips!